Join Arkansas Natural Heritage Commission botanist Brent Baker May 19, 2012, at 10 a.m. for a plant walk along the newly established trails at South Fork Nature Center, situated on a peninsula of Greers Ferry Lake at the confluence of the South Fork of the Little Red River in east-central Van Buren County. After a tour of the Riddle Cabin, a century-old log cabin relocated to the site and which was the birth home of folklorist Almeda Riddle, you will be able stroll along a trail system through many of the different habitats on the property. The trails wind through glades and spring runs; atop sandstone bluffs; through oak-hickory, pine-hardwood forest, and pine forest; near an upland depression wetland; and to a bedrock-bottom stream that flows into the lake via a seasonal waterfall. Several portions of the trail system offer wonderful views of the lake. Directions: From the junction of U.S. Highway 65 and AR State Highways 9 and 330 in Choctaw, south of Clinton, travel approximately 3.7 miles east on AR State Highway 330 toward Greers Ferry Lake to Klondike Road. Turn left (north) on Klondike Road and travel approximately 1 mile to a point where Klondike Road turns sharply to the right (east). Instead of following to the right, continue straight north (this is Bachelor Road, but sign may not be present) and travel one-half mile down into a stream valley, over a small bridge, and then up to the top of the hill to the black iron gate on the right. Turn right and travel approximately one-quarter mile through the gate, past two homes on the left, to the first dirt road on the left. Take the left turn and travel about 0.15 mile to the log cabin. For a map or more information about South Fork Nature Center, visit www.southforknaturecenter.org. On the website, you can also check out a list (by clicking on the “Reports” tab) of the plants documented from South Fork property, as well as descriptions of the habitats present on the site. Join Baker for the morning only or bring a lunch and continue the walk during the afternoon. For more information, contact him at 479.970.9143 or brent@arkansasheritage.org. 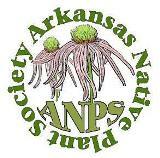 This entry was posted in Field Trips and tagged Arkansas Native Plant Society, South Fork (Arkansas) Nature Center. Bookmark the permalink.